2017 Grants are now open! An opportunity for all Victorian schools to apply for one or all nine grant categories is now available. Applications opened on the 1st March and will close on 28th April 2017 at 5pm. With $30,000 worth of vouchers or products to be won for your garden, enter your school now. A new and improved grant application system is now in use, making online entry stress free. For more information on the Grants program, please go to the Grant section on this website. Esteemed in history, Moorabbin Primary School No. 1111 dating back to 1875 was announced as the recipient of the 2016 Kevin Heinze Perpetual Award for school garden excellence at the Victorian Schools Garden Awards (VSGA) ceremony. Moorabbin’s grounds, once a barren underutilised facility has been transformed into an indigenous habitat, with frog friendly gardens, productive zones, fruit orchards and a chicken coup, changing their outdoor spaces into stimulating learning opportunities for the 245 students who attend the school and partake in weekly sustainability classes. Over 300 students attended the VSGA Presentation Ceremony held in the beautiful and ideal surrounds of the Royal Botanic Gardens Melbourne to celebrate their gardening achievements. 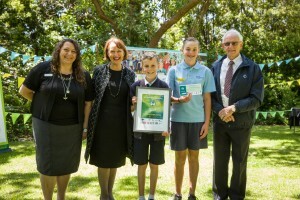 In excess of $40,000 worth of prizes was distributed amongst the winning schools to continue the growth of their gardens. Ms Judith Graley MP, Parliamentary Secretary for the Minister of Education, presented the state and perpetual awards along with Paul Crowe OAM, VSGA patron and co-founder. The VSGA program which will celebrate its 40th anniversary next year has a long history of encouraging schools to consider their outdoor spaces as an important facet for learning, acting as classrooms for hands on education while improving student health and well-being. It also acts as a vehicle for getting children involved in gardening and creates awareness of future employment opportunities in horticulture and environmental industries. “We would love 2017 to be even bigger”, explains VSGA Chairman Craig Taberner, “I encourage all schools to get involved – it is simple, apply for a grant or enter for an award”. This is an exciting time of year as the Victorian Schools Garden Awards (VSGA) judge all submissions, and announce the winners of our Regional Awards as we head towards our official Presentation Ceremony on 29 November at the Royal Botanical Gardens Melbourne. With entries closing just before the end of Term 3, the VSGA Committee spent the school holidays and start of term 4 judging over 100 entries from schools across Victoria for all awards on offer. As always the committee were impressed with the quality of entries and work schools are undertaking in their school grounds. Gardens are now being seen as an important element of school education. The committee applauds the efforts of schools who are expanding their grounds from basic produce gardens to include swales, wetlands, acquaponics, compost and worm farms, animal husbandry and more. Classes are being taken outdoors and students are learning science, maths, history, art and language from hands on activities. It is never an easy task selecting winners. We appreciate the amount of time and effort students, teachers and parents put into your gardens and lodging an award entry, and we do wish we could reward all schools. Those schools that were unsuccessful this year are encouraged to try again next year. It may be only a matter of a few points that separates you from ultimate success under the VSGA program. VSGA grant applications closed on 29th April with over 300 applications received from 230 schools across Victoria. Since the Grant program began in 2014 entry numbers have increased each year, proving that schools want to undertake garden projects but sadly lack the funds to undertake improvements, make overs or incorporate new gardens in their grounds. Over the last month the VSGA has had the difficult task of assessing schools for the 48 grants that were available. The Maxicrop – Edible Garden Grant was once again the most popular category with 106 applications received, with Flemings Orchard Grant and Independent Schools Victoria – Sensory Grant also receiving high entry numbers. The VSGA would like to thank all schools who applied for a grant. The submissions were very impressive and it was extremely difficult selecting the successful recipients, especially with an increase in the number of entries. We hope those unsuccessful schools are not discouraged and try again next year. The 2016 VSGA grant applications are now open. With a variety of categories to choose, schools may apply for more than one grant category but separate applications will be required and one grant per school will be awarded. The procedure to apply for a grant is simple. Complete the online 2016 Grant Application Form entering your school’s details and answering the five questions including a budget. You will need to create a login which allows you to save your grant application and return to it at a later date or submit your form upon completion. You will then receive confirmation that your Grant application has been received. The Grants program has over $32,000 worth of grants to distribute to schools. The grants come in the form of a voucher to be redeemed at a retail nursery which is a member of the Nursery & Garden Industry of Victoria (NGIV).